Officially this is day 1 of camp, but most athletes won’t arrive until late afternoon so for us coaches it’s an easy day. I’m making the most of it, the next two weeks will be hard work. It’s not so much the physical demands, other than accompanying athletes on their rides – and we’re contemplating hiring a car to support the full Ironman day – Mark and I won’t be training that much, but organising a camp and managing a group of triathletes takes its toll. 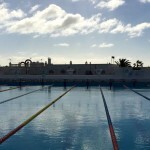 We have a busy schedule planned – lots for the athletes to do, lots for the coaches to do. If last year is anything to go by the athletes will probably complete somewhere between 20 to 30 hours over the 6 days of training that makes up a week of camp. For one athlete, Frankie Sanjana, here for both weeks, that could make for a very big fortnight of work. Volume is a major goal for the camps, we want athletes to push themselves, to do more than they think they can, but we want them to come away better for it; more is not the only goal. To that effect day 2, the first full training day, will combine a relatively short and easy ride (tested by us on Thursday), an afternoon spent individually filming and coaching swimming, and a final 5.4K time trial run (before we’ve fully worn the athletes out). From there the training will build until Wednesday when we split the day in two – the morning a short race and the afternoon off (or a chance to run for the more determined). Thursday is a ride round the full Ironman course and finally Friday sees a time trial up Tabayesco along with another go at the 5.4K run. After a day off the coaches will get to repeat this pattern over again. The weather for the next week is windier than we might have liked, but that’s part of the challenge of Lanzarote. It’ll ensure everyone works and will send them home stronger. 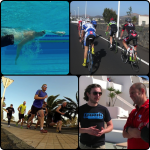 My own personal objectives are simple: make these athletes fitter, learn from them and survive the two weeks.